To understand Crossover Cable working, it's important to understand the crossover cable color code i.e. pattern in which wires are connected to RJ-45 connector. We start by looking at the diagram. We can see in above diagram that left side is following 568B color coding and Right end is following 568A color coding. Following Table illustrates TIA 568B color coding scheme which is applied on left end of cable in Crossover Cable Wiring Diagram. This color coding standard is applied on right end of cable in Crossover Cable Wiring Diagram . 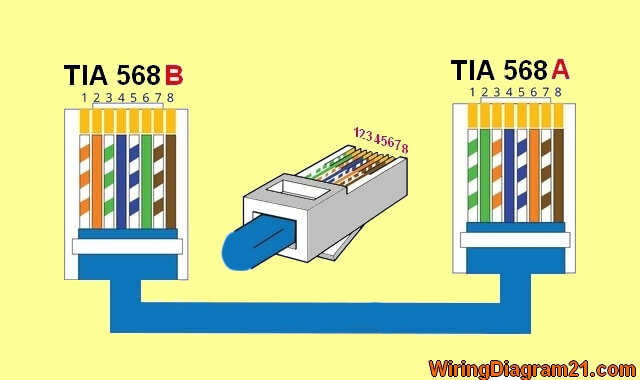 To make a crossover cable one end of UTP cable has to follow either TIA 568 A or B Color coding, while other end must have different color coding. In short, both ends must have different color coding schemes. Use following guide lines while making cross cable. If one end of cable has 568A color coding then other end must follow 568B color coding. If one end of cable has 568B color coding then other end must follow 568A color coding. This is different than straight through cable in which both end of cable must have same color coding standard at both end , look for a Straight cable color code . As in UTP there are eight wires twisted together in four pairs. In Fast Ethernet pin 1 and 2 of RJ-45 connector are reserved for transmission while pin 3 and 6 of RJ-45 connector are reserved for receiving. As pin 1 is transmitting so it cannot be connected to pin 1 at other end since that too is transmission mode. It follows that pin 1 should be connected to pin 3, which is in receiving mode. To sum up pin 1 and 2 from device A are connected to pin 3and 6 of device B, while pin 3 and 6 of device A are connected to pin 1 and 2 of device B. It's important to have good understanding of color coding schemes in crossover and straight through cable but today almost all networking devices support Auto-MDIX, by which devices can automatically detect which cable is required and switch to it automatically. So if you are connecting similar devices and you only have straight through cable, you can use it.